You are here: Home / Student/Alumni Achievement / UTM FKE Student Team won SAS Track in Innovate Malaysia Design Competition 2018 Central Region. 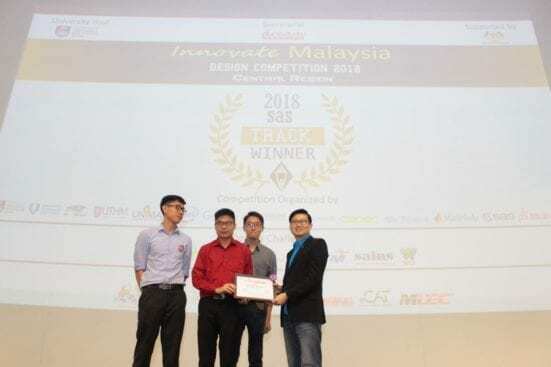 SELANGOR, 13 MAY 2018 – The FKE student team from UTM is the winner of the SAS track of Innovate Malaysia Design Competition 2018 (Central Region). The winning team, named ‘InsightX’, beat 13 other teams from all over Malaysia and won the judges over with their product which functions as industry machinery diagnosis system. The team comprised 3 FKE students, namely, Tay Yee Yang, Teh Zhi Huei and Chin Hung Wei with their advisor, Dr Yeong Che Fai. Innovate Malaysia Design Competition, IMDC is the largest multi-discipline engineering design competition in Malaysia which open to all final year undergraduate engineering, computer science, IT and science/mathematics students in Malaysia. Technology companies, including Google, Intel, Keysight, MathWorks, Microsoft, SAS, SilTerra, and SOLIDWORKS, work together to co-organize the competition with the secretariat of Dreamcatcher. Innovate Malaysia is also supported by Ministry of Higher Education, MaGIC, CADVision , @CAT Penang, MDEC, IEM, and Techsqurce. IMDC has been divided into four regional competition which are Southern Region in Johor Bahru, Northern Region in Penang, East Malaysia in Kuching and Central Region in Kuala Lumpur. All the winners of Technology Tracks and Design Challenges in each regional competition will advance into Innovate Malaysia Design Competition Grand Finale which will be held on 9th and 10th of July 2018.